What is the difference between Chinese bao/baozi 包/包子 and mantou 饅頭? Boazi is bun with filling and mantou is without filling. The word bao 包 in boazi means 'wrap' so it is obvious with filling. Mantou 饅頭 is the staple carb for Northern Chinese more than rice, it is eaten at breakfast, lunch and dinner in place of rice. Plain mantou's texture is normally a bit chewy not like Cantonese cha siu bao super white doughy soft cakey like texture sweet and stick to your teeth. Traditional mantou is very plain, white not much flavour and normally shaped like a little pillow or just a plain round bun. Nowadays there are hundreds of different flavoured mantou including adding vegetable juice like spinach juice, carrot juice and vegetable puree like pumpkin, some use different flour like cornmeal, wholemeal, millet, black glutinous rice flour etc..... For cuteness and prettiness many mantou are shaped into animals or flowers (called flower bun or hua juan 花卷) etc.. The only constant and never change is mantou is without filling and steamed. Flower bun is slightly different than plain mantou it can have some spring onion, vegetable or ham added to enhance the flavour and these bits are kneaded with the dough not filled. deep fried mantou enhances the flavour and texture, crisp and nutty on the outside and soft inside. sliced mantou dipped in beaten egg then fried with a little oil till golden is delicious. How to make mantou? Very easy if you can mix a dough you can make mantou. For a standard mantou all you need is some flour, yeast, water, pinch of salt, sugar and a steamer. Plain flour mantou is softer and bread flour mantou is chewier, both equally good. If you like a pure white mantou use bleached flour. This is a standard plain mantou recipe. Mix dry ingredients together, slowly add water and start mixing till the dough is formed and no more dry flour. No need to knead right away leave to rest for 15 - 20 minutes this way dough is less likely to stick to your hands. Then knead dough till smooth. No need to over knead or buns can be quite chewy. Cover and leave to proof for about 45min - 1 hour. 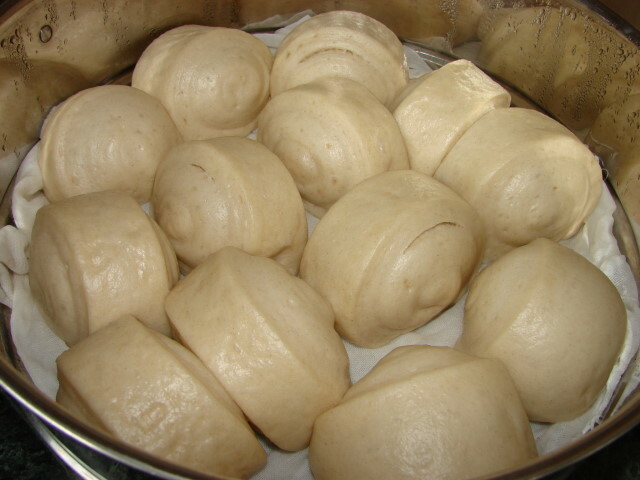 The dough does not need to expand to twice its size, some sign of swelling is ok. Then it is ready to form into buns. Simplest way is roll the dough into a thick sausage about 3 - 4cm thick then cut the log into 3 - 4cm thick pieces. Roll the dough out into a sheet about about 35cm x 25cm x 0.5cm thick, very lightly brush the top layer of dough with water. Roll this sheet up into a log. Using both hand lightly roll the log to tighten and stretch it to about 40 - 45cm long. Cut the log into 3 - 3.5cm thick pieces (about 10 - 12 pieces). This method of forming dough the resulting buns will show a spiral pattern on the cut sides. Take a chunk of dough about golf ball size and roll it into a ball. Once the bun is shaped. Line one or two steamer trays with muslin cloth or perforated baking paper before putting the buns in, leave enough space for buns to expand. Leave to rest for 25 - 30 minutes. Heat steamer till boiling then steam buns for about 18 - 20 minutes at medium heat.These buns will swell up to 2 - 2.5 its original size. Do not open lid after steaming is done. Remove the steamer tray with the lid on and cool buns for about 5 - 10 minutes. Opening the lid soon after steaming the skin of the buns will dry quickly due to steam vaporisation from the surface. These are some variations, add a touch more water if the dough is dry. replace water with vegetable juice or puree. Don't you use any oil, shortening, or lard for this recipe? Love your blog. Great Pictures. thanks! oh! and Happy Easter! Traditional plain mantou does not contain any oil or other fat. However if you like you can add some oil. You can also sub water with milk. The variations with other added ingredients are endless but simple plain mantou just a simple leaven carb with little or no sugar and no fat. This is an awesome blog with so many authentic recipes! I want to try this recipe out, but was wondering if the dough was freezable or not since I'm only one person. anyway, soooo many recipes to try out! It is better to to freeze the cooked buns. Freezing the raw dough can be tricky, the dough can be overproof or getting wet and sticky once it is thawed and ready to shape. Defrost the cooked buns before reheat, just steam or wet the buns then wrap with baking paper/paper bag and microwave for 1 min or a little bit more till heated through.